The Central Elections Committee dismissed on Thursday motions to disqualify Otzma LeYisrael, Shas and the United Torah Judaism from running in the 19th Knesset election. After banning MK Hanin Zoabi from running in the race and striking motions to disqualify Balad and United Arab List-Ta'al Wednesday, the Elections Committee commenced its second day of deliberations by dismissing a motion submitted by Balad, Hadash and the Coalition against Racism in Israel to ban Otzma LeYisrael. Seventeen committee members opposed the bid, three were in favor and two abstained. Later, the committee unanimously dismissed motions to disqualify Shas and the United Torah Judaism on the grounds of women's exclusion. No one voted in favor of disqualifying the two haredi parties; 21 members opposed. Discussing the bid against Otzma LeYisrael, a representative of the Coalition against Racism said: "We ask that the list be disqualified because Knesset candidates on its behalf continuously incite hatred... not only against Arabs but also against many other sectors. This incitement is later manifested in violence." Balad's Alaa Mahajneh added: "This is a chance to keep what's left of Israeli politics clean. Party leadership members, as well as many of its supporters, are enthusiastic supporters of Rabbi Meir Kahane… and the successors of the Kach movement, which was declared a terror organization." In response, Itamar Ben-Gvir, running on the Otzma LeYisrael ticket, said that he and his comrades have nothing against Arabs, but are rather "against anyone who is not loyal to the State of Israel – anyone who sits in the Israeli Knesset but wants to destroy Israel." 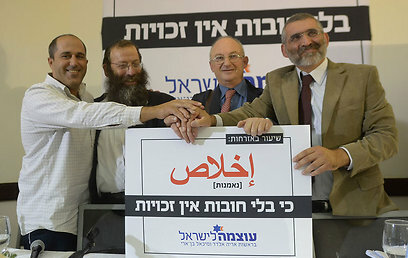 Arguing for the disqualification of Shas and the United Torah Judaism, the bid's initiators noted that parties funded by the public that exclude women are undemocratic. Hannah Kehat of the Religious Women's Forum Kolech added: "Haredi women begged us to do whatever we could to break that barrier. They're afraid and under threat. I'm speaking as a woman who grew up in the haredi society. I think it's about time we ended this discrimination, marginalization and silencing." Responding to the allegations, a Shas member turned to the committee and noted that out of 33 members, the committee boasted only two women.